It was a wonderfully warm January day. The sun was out and the chickens were scratching happily in the muddy pasture. I had been hoping to burn off the weedy patch that I call a garden and get rid of my stash of boxes in the old tool shed to boot. I grabbed my utility lighter and a bucket of water, just in case, and headed out to the garden. The tool shed door doesn’t close properly and the last time I was out there I didn’t bother closing it all all. I thought it might be a good place for the cat to get in out of the cold when he decides to camp out overnight. There aren’t actually any tools in the shed. I used it as a ‘summer cottage’ for the chickens the summer before last and I’m hoping to raise turkeys there next year. But at this point the shed was full of boxes left over from hauling produce home from the store…way more boxes than I can break down and fit in the recycling bin. So I started hauling boxes out to the garden and started my little ‘biochar’ project in the bed that had potatoes last year. I pulled more and more boxes out and burned off a good portion of the garden. As the boxes dwindled, I noticed a pile of leaves in the corner of the shed. Several times I walked within a couple of feet of those leaves before I noticed them rustling around. My heart stopped when I saw some black and white fur nestled in that comfy bed of leaves and I practically tripped over myself as I sprang toward the door. After a few hastily uttered curses, my pulse slowed and I got my nerve up and poked my head back through the door and watched as the skunk settled back down for his nap. I counted my unscented blessings and went back to my garden project, all the while trying to come up with a plan for evicting the squatter in the shed. That evening, with no plan formulated in my mind yet, I talked to my Mom on the phone and told her about our uninvited guest. Moms are such a wonderful source of wisdom and encouragement. She told me the story of my Grandmother discovering a skunk in her basement when my Dad was a teenager. The basement stairs led outside through the old wood shed and Grandma had her old wringer washer down there. She was so unnerved by the skunky surprise that she threw an entire glass bottle of ammonia down the stairs. Of course the bottle shattered and the ammonia fumes quickly filled the basement. The skunk immediately high tailed it out of there and never returned. This story planted the seed of a plan in my brain. I got the ammonia out, filled an old cottage cheese container about 1/3 of the way and headed out to the tool shed. I tossed the open container in the shed, a few feet from the pile of leaves, and put some distance between myself and the door. I could hear the leaves rustling and a faint growling sound from inside. I decided that the best idea would be to head inside and wait until the next morning to see if the shed had been evacuated. The next day dawned nice and bright. I took care of the chickens and headed back to the shed to check for our guest. Other than the nest of leaves and a faint smell of skunk, there was no sign of the black and white visitor. I sighed in relief and forced the sticky door shut and locked it up to prevent any other opportunistic critters from moving in and setting up house. Thanks for the skunk removal idea Grandma and Mom! This article was originally posted on my first blog Little Homestead on the Hill. A quick update: I keep the door to this shed shut nice and tight all the time now. 🙂 I raised 17 turkeys in this shed and last year I intend to raise a batch of meat chickens in there as well. I hope you learned a little lesson about keeping things cleared out and locked up from this story! I LOVED this story! We had 4 skunks in our old community hall a couple of weeks ago. That would have been a great thing to try. Instead, two of our young men in the community went in and shot the last two, and wow, what a smell!!!!! We’ve been leaving windows open and cleaning with vinegar ever since. The smell is getting better, but if that ever happens again, will remember the ammonia trick. Mom’s are great, aren’t they???? Oh, my goodness, Arlene! I can only imagine! I’m sorry I didn’t get this story to you in time to try this. I wonder if loading up a squirt bottle and putting a respirator on, then opening windows and spraying the room would have made them search for better digs. I hope you never have to worry about it again! We’ve not had any major encounters with critters yet, but I know that is coming. The closest we’ve come to a skunk was seeing one after dark on the other side of the neighbor’s fence. Lucky it didn’t get any closer! Good luck keeping the critters at bay, Jenny! What a great idea of your Mother’s. 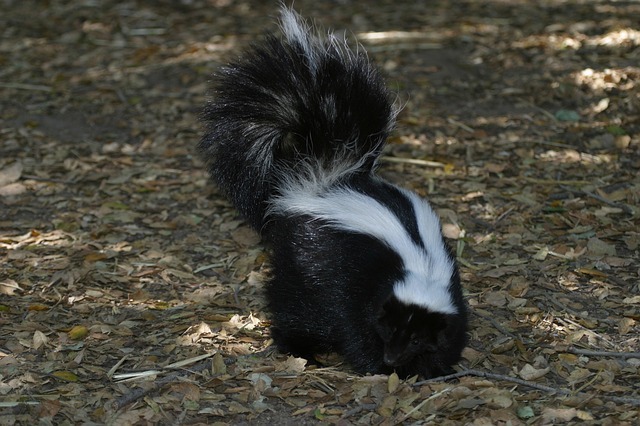 Skunks obviously find other smells repugnant then?! Thank you so much for sharing this with us on Natural Mothers Network! I am really looking forward to hosting the Seasonal Celebration Linky Party #7 going live tomorrow and hope you’ll pop over sometime-you’re always welcome! I’m guessing that everyone hates the smell of ammonia! LOL! Love your story! Sure wish I would have known that little trick a while back! We’ve had a few visitors ourselves…. You’re absolutely right…It is such a shame that so many people have no idea what living in a rural area is like. What a clever idea! Very smart and yes we can learn so much from our Mom’s and Grandmas! Your mom’s story reminds me of a time when my sister was watering plants for a family down the street from us. They had a big empty barrel sitting next to their back porch, and one day she found a small raccoon had been trapped in it. I stopped her just before she was going to reach in and lift it out! Yikes! Lucky that you were there in time to stop her!